TIMESHONGKONG, MALANG – MK RI (Republic of Indonesia Constitutional Court) stated its readiness to face reported dispute cases in the implementation of the General Election 2019. 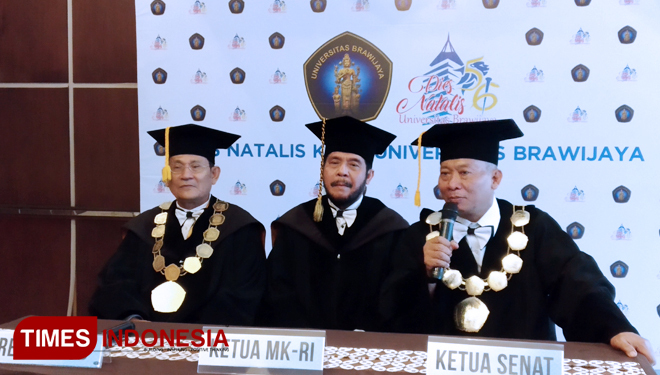 This is conveyed by the Chief Justice of the Republic of Indonesia Constitutional Court Dr Anwar Usman, after attending the Open Senate Meeting of the 56th Anniversary of Brawijaya University, Saturday (05/01/2019), in Samantha Krida Building UB, Malang City, and East Java. Anwar explained that ahead of the upcoming election April 17, the Constitutional Court had made five regulations that had been socialized to all political parties participating in the election. "It has been socialized to all political parties participating in the election including advocate organizations, community organizations, how to deal with it later if there is a dispute, including the dispute over the presidential election," he said. He said this readiness applies to all Legislative Elections (Pileg) and Presidential Elections (Pilpres) carried out simultaneously on 17 April. He emphasized that the Constitutional Court is ready to process as many as possible the number of election dispute cases that entered. "MK is ready regardless of the number of cases that enter for legislative elections, MK is ready," he said firmly. It isn't only facilities, the human resources (HR) has also been prepared, including the law clerks and all the officers in the Constitutional Court (MK).